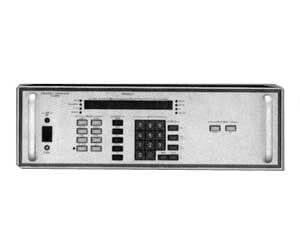 The FS2000 family of frequency synthesizers operates in the frequency of 1 MHz to 18.4 GHz and offers sub-microsecond frequency switching speed, and sub-microsecond level correction, coupled with superb spectral purity. With an installed base supporting hundreds of sub-microsecond switching and high spectral purity applications, the FS2000 family is a proven performer for a diverse range of stringent applications. Introduced in 1986, FS2000 frequency synthesizers incorporate the most significant advances in frequency synthesizer technology and are based on Aeroflex patented wideband direct analog synthesis techniques. The FS-2000 is based on an iterative, modular direct analog architecture with a central reference generator that synthesizes 50, 100, 150, 200 and 800 MHz signals from a 100 MHz reference derived by multiplying a 5 or 10 MHz reference oscillator appropriately and improving far-out noise by judicious filtering. All frequencies are derived in an iterative frequency generation architecture. Frequencies are generated as a decade of frequency steps over an octave from 500 MHz inputs to the next stage. Final outputs are produced by a scaling module which provides for doubling, dividing, or heterodyning to achieve a range of 10 MHz to 2.3 GHz. The FS-2000B family consists of a keyboard mainframe with GPIB.